As I previously posted (http://wp.me/p2jaSq-2k), the Essbase 11.1.2.3.500 patches include many new features, but that was not all. Oracle had another patch hit just a couple of days later as John Goodwin reported (http://john-goodwin.blogspot.com/2014/03/epm-patch-11123500-has-landed.html). So, I had a new install at a client and wanted to see how all of this actually works. 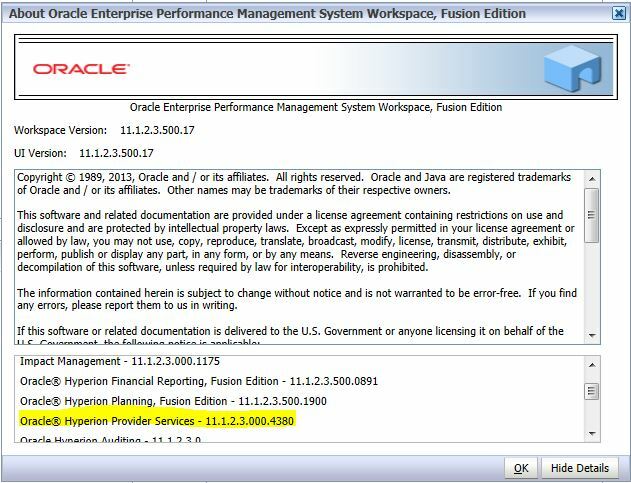 I installed EPM 11.1.2.3 as normal. At this client, that included Essbase, EAS, APS, FR, and OBIEE. I started by applying the new Hyperion HUB patch 17529887. The “superpatch” as Goodwin called it did appear to patch many products. My Foundation Services, Provider Services, Financial Reporting, and Reporting and Analysis Framework all seemed to have been patched. That’s fantastic; however, APS was not patched to 11.1.2.3.500 as expected, it was a lower version, 11.1.2.3.000.4380. EAS and Essbase were not touched by the superpatch. Workspace Help>About screen with version information.